First of all, a big thank you for your work. This app worked perfectly on my Xperia X on 3.0.0.8. Before updating to 3.0.1.11 I removed it. The update was successful, but now this app does not install any more. It says: File './non-oss/noarch/sailfish-tutorial-data-0.2.3-1.8.1.jolla.noarch.rpm' not found on medium 'https://releases.jolla.com/releases/3.0.1.11/jolla/armv7hl'. I'm not sure that is linked to this as I saw something similar when trying to update meecast eventsview. From the terminal try doing the command pkcon refresh as root ti see if it resolves it. However, the patch is not workimg on 3.0.1.11, I am working on a fix. Hi all, patchmanager failed to remove the patch when updating to 2.1.2.3. Can you help me? Hi, and thanks for your help. With your command line, warehouse and storeman tell me that the patch is removed, but it is still in patchmanager, and the os update fails. Any idea? Hi, in older Version I was able to change language by editing the unified_diff.patch. In Version 0.6 it is no more possible. Cold you tell me what file I have to edit to change language? I plan to work on translation support soon. 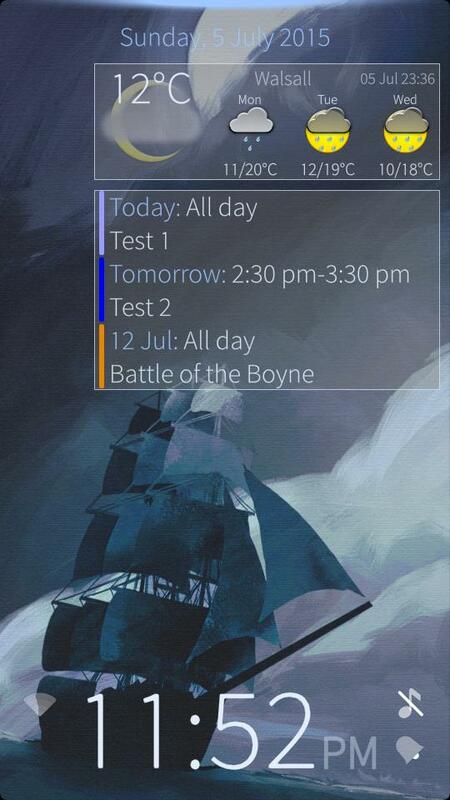 Wishlist : make widget position adjustable. This patch fail to install with the last Sailfish version, any idea? Just tried it and it seems to be ok. It conflicts with my lockscreen widget manager and so won't install if you have that installed. Privacy-paranoid users should be aware that this patch displays next calendar entries even if the device is locked. This patch is not compatible with Lockscreen analog clock patch. Can you add support for this ? 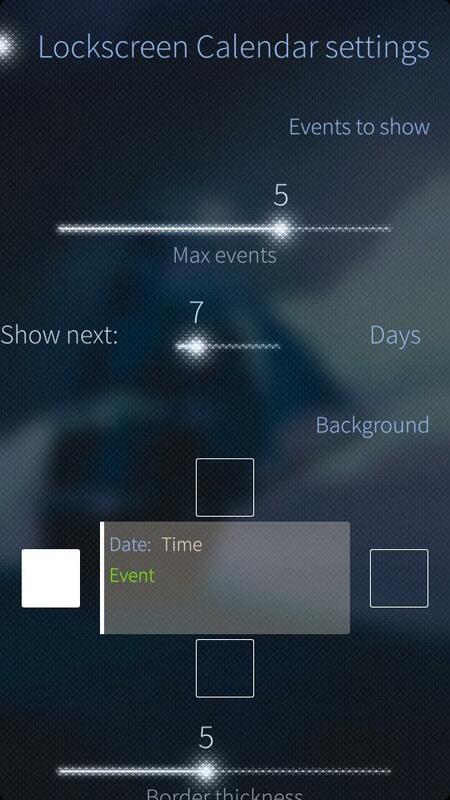 I am working on a lockscreen widget manager which should hopefully resolve these kind of issues. Thank you for 2.0 support! Little bug(? ): if there are a lot of upcoming events, only the latest events are shown (not the nearest), because it scrolls automatically to the latest. Could you fix it, please? It was a bug introduced as part of the event name scroll. It could be turned into a feature though. Any plans to bring this excellent patch to Sailfish 2.0? 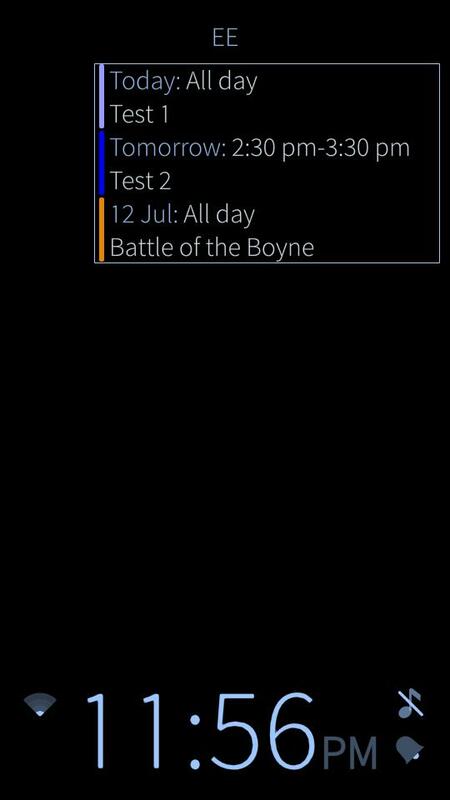 Even though Sailfish 2.0 now has calendar entries in events view, it's inadequate as it doesn't show any future events (only next 2 for current day). 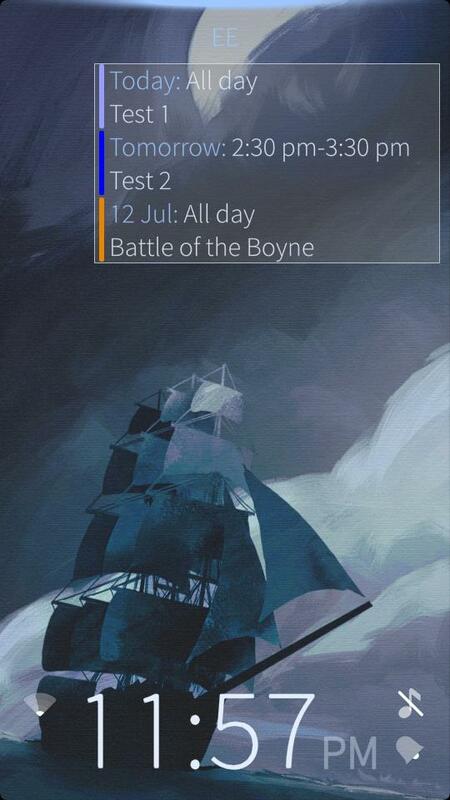 Furthermore it's very convenient to see upcoming calendar entries right away on lockscreen. Hey there, on the openrepos warehouse client I did not see the line telling me to remove the battery and status indicator patch prior to disabling yours. Now I am stuck with a phone I can't use. I still can SSH into it but I cannot do anything. How do I reapply your patch to get out of this mess? I did not remove the mentioned patch before but disabled yours and restarted the services. 1) Unapply all lockscreen related patches in Patchmanager but do not restart preloaded services. 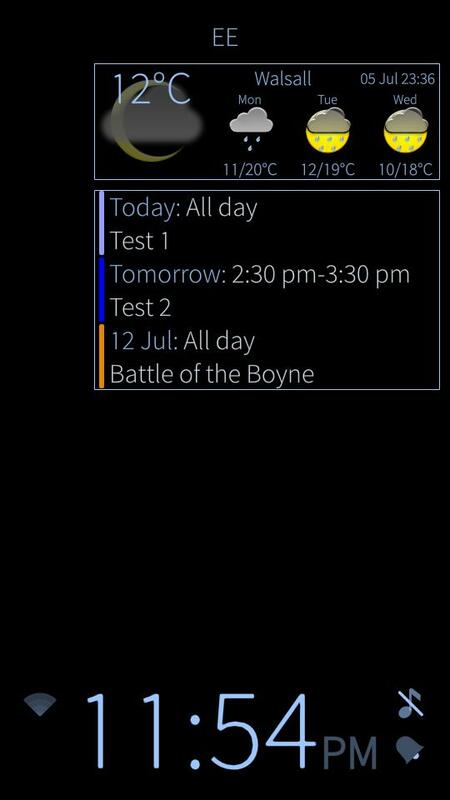 3) In /usr/share/lipstick-jolla-home-qt5/lockscreen/ remove ShowCalEvents.qml, BorderRectangle.qml, LockEventItem.qml and LockTimeLabel.qml if they are there. Thanks for the patch! Could add, please, ability to break long titles on multiple lines? Perhaps there is a compatibility issue with some other patches, difficult to analyze. Anyway, after activation failed, I couldn't reinstall or uninstall this patch (same issue reported by @Sanktus). The patch still remained in the patchmanager list (activation impossible). Then I removed it completely (deleted manually all files assumed to be related with lockscreen-upcoming, including "rpm -e --noscripts lockscreen-upcoming"). After that, the patch eventually disappeared from the list of available patchamanager options, but I'm still unable to reinstall/activate it successfully (current version or previous one). Of course, I can't confirm I've actually deleted absolutely everything that was supposed to be removed or cleared before a clean installation. 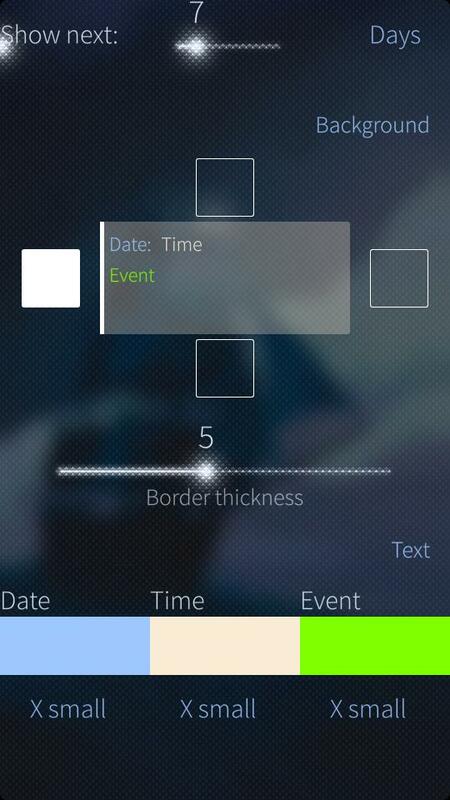 Running SFOS 1.1.6.27, nine other patches applied (Calendar patch, upcoming events in cover, zoom patch, battery statusbar on lockscreen, eventsview controls with settings, launcher combined, lockscreen player controls, meecast widget, display sneak peak). and skip already unapplied entries. Then you can reapply this patch as usual.